Removable toilet paper holder attaches to 1-1/4" Diameter colored grab bars, 15 colors available. MAXIMA Series Vinyl Coated Colored Toilet Paper Holder attachments are corrosion free, non slip, soft and warm to the touch with BioCote® antimicrobial protection, bio-compatible, electrically insulated, self-extinguishing and made with a high percentage of recycled raw materials and recyclable. Perfect for commercial and residential environments. 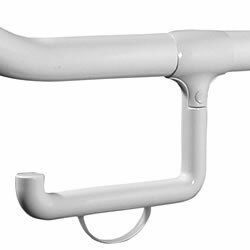 Can be used with any 1-1/4" Diameter Grab Bar or Folding Grab Bar.